Last Thursday, a collection of student artwork was exhibited in Zilkha Gallery for the Annual Student of Color Art Show, formally titled, “BE THE ART.” Students of Color showcased talents in a multitude of mediums, ranging from plaster and photography to rap and spoken word. 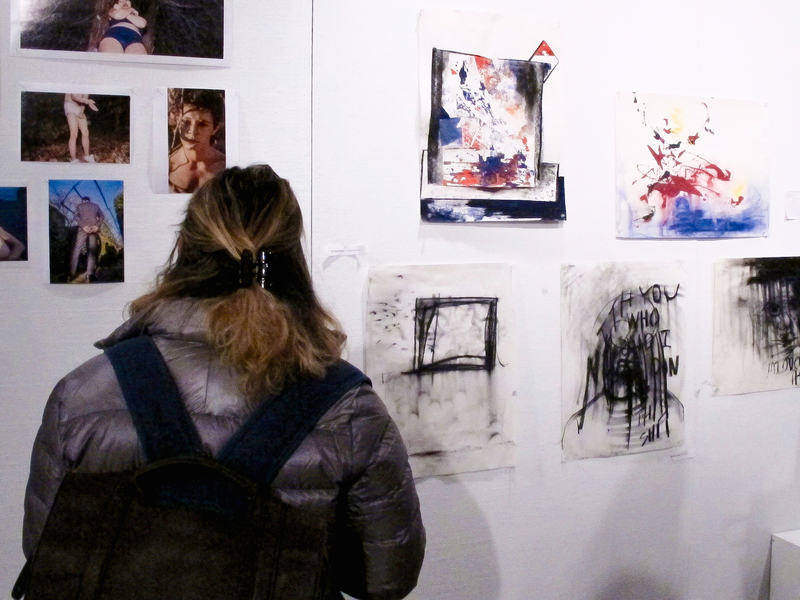 The exhibit, which was housed in the first room in Zilkha, contained the work of 11 visual artists. From the highly stylized cartoons of Malcolm Phillips ’19, whose work is approaching celebrity status on campus, to the Chinese takeout boxes contained in a mass of white plaster by Shirley Fang ’18, the pieces revealed the incredible skill present in the student of color community, not to mention the creative power of the University at large. Another Black Lives Matter-associated piece was that of Ocean Gao ’19, who exhibited a t-shirt with a portrait she sketched of Eric Garner with the words “I CAN’T BREATHE” taped over his mouth. Under the image reads, “The world is not OK” in a deep red. Gao is selling these shirts and donating 100 percent of profits to the Black Lives Matter movement. She also exhibited a drawing that focused on sexual assault rather than race, depicting a face with “YOUR FAULT” written over and over again on it and a white hand covering its mouth. Many pieces, however, were less politicized, such as one from Eunice Lee ’19, who showcased a life-size self portrait entitled “Contemplation,” which portrays her looking in a mirror so that we see the back of her physical body and the front of her reflection. Lee explains in the plaque next to the pastel-on-paper piece that her reflection represents her inner self, and that it is blurry because she does not yet know who exactly this inner self is. One piece from Gandharv Chawla ’17, “Deconstruction/Reconstruction,” exposed the process of art-making by incorporating four images that were part of its creation. The final product is a fascinating piece of art that plays with depth: It’s an image of a blank face propped up by sticks stuck into clay, and the various parts of the face parceled out at different levels in front of the face, also propped up by sticks. From straight-on, the image coheres into a complete face, but from any other angle, it’s a somewhat unsettling collection of sticks and face parts. As students filtered in and out and music played from a desk pushed up against one wall, a live performance piece started toward the back of the room. Unfurling a long, horizontal piece of canvas, Fang and Christian Black ’18 began a collaboration in charcoal on the blank space, Fang releasing a mesmerizing series of abstract shapes and Black jotting down poetry as she drew. The visual aspect of Black’s poetry, whose lines wove in and out of Fang’s drawings, blurred the division between image and word. When the piece was finished, the two artists laid it out diagonally on the floor of the room, where it remained for the remainder of the evening. Soon after, attendees were informed that the spoken word performances were about to begin, and most sat down on the floor alongside the strikingly powerful canvas. The spoken word performances were as varied as they were impressive, opening with one by Hazem Fahmy ’17, which used film to address other weightier issues such as fear and violence. However, the live performances weren’t exclusively spoken word. Sahil Singhvi ’18 performed a rap over beats that sampled Coleman Hawkins’ “Body and Soul.” Halfway through, he asked if anyone could identify the sample; no one could. Singhvi also happened to be wearing one of Gao’s shirts, testifying to the interconnectedness of the art on display. I left the show reeling from the sheer force of the performances and visual art, unsurprised by the talent on display yet still utterly in awe. Whether pointing to injustice and the lack of social change through mixed media or delivering raw, emotional spoken word pieces, the students whose work was exhibited on Thursday testified to the importance of a campus space highlighting their all-too-underrepresented prowess.